Little Nemo: Adventures in Slumberland | Anime etc. If you know the history of comics, you’ll know Little Nemo. It was a legendary New York newspaper strip, published a hundred years ago, where a little boy has strange and scary dreams. Drawn by Winsor McCay, it’s a masterpiece technically and creatively. Its fame spread to Japan, and decades later producer Yutaka Fujioka dreamed of turning it into a cartoon film that would be a world hit. By the early 1980s, he’d set up the film as a Japanese-American co-production. Notoriously, the Nemo film had a long and torturous development, as the artists desperately tried to do justice to McCay’s incredible visuals. In the final movie, little Nemo, the dreaming boy, is flown from his bedroom to the magic kingdom of Slumberland; the flight’s by airship, with a Laputa vibe. Here, Nemo makes a terrible mistake and unleashes a demonic nightmare monster, spending the rest of the film questing to vanquish it. Nemo’s allies include a prim princess, a delinquent clown (voiced by Mickey Rooney) and… a cute flying squirrel to make McCay purists howl with rage. A ridiculous number of legendary names had input on the film on the American side. We’re talking great writers like Ray Bradbury and Robert Towne; artists like Moebius and Brian Froud; and songs by the Sherman Brothers, who’d brought us Mary Poppins. The actual animators, though, were Japanese, working at Tokyo Movie Shinsha, which Fujioka had founded back in 1964. The studio wasn’t just making Nemo in the ‘80s; it was also animating a little film called Akira. Nemo’s animation is the best thing about it, showing how adaptable Japanese artists could be. It’s the most Disneyesque anime ever made, not great Disney, but still lively and pleasurable to watch. No, Nemo’s problems lie with its meh characters, its jerky pacing and its strangely stilted English voice-track. By the time it opened (1989 in Japan, 1992 in America), Ghibli was rising in Japan and Disney was revitalised in America. Nemo flopped. But that’s only half the story. Nemo’s development was so crazy that its best animation wasn’t in the final movie! During the long years when the studio was trying to hash the movie out, two test “pilot” Nemo films were made. So they were just storyboards or pencil outlines, right? Wrong. We’re talking about completely finished, gorgeous animation, fully painted, which must have taken a horrendous amount of manpower. In effect, they were two of the most expensive “deleted scenes” in film history. Both pilots are easy to find online, though they make most sense if you see the final film first; it’s on youtube at the “TMS Official Channel”. One of the pilots is a three-minute film from 1984, directed by Yoshifumi Kondo, a frequent collaborator with Miyazaki. (He’d later direct the wonderful Ghibli film Whisper of the Heart.) His test film is breathtakingly Ghibli-esque, showing Nemo on his bed flying through the night. The boy’s joined by a youth on a biplane; together they zoom down rivers (surely the model for a river scene in Porco Rosso) and crash through waterfalls. 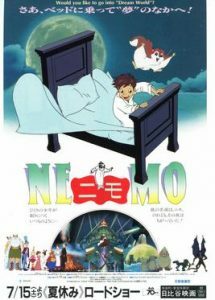 But the Nemo pilot made in 1987 is even more eye-popping, directed by Osamu Dezaki (Rose of Versailles). Ten minutes long, it features multiple scenes that are adapted in the final film, but Dezaki’s version is way more spectacular. 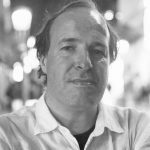 His pilot has far more physically dimensional characters – shades of Akira – and terrifically elaborate, intricate animation. For animation buffs, it’s less like Disney than The Thief and the Cobbler, another impossible-to-make animation that was never finished in its intended form. The final Nemo movie may seem an abject failure; so much work, so much talent, such an underwhelming result. Yet its production is inspiring. It united American and Japanese dreamers of the level of Nemo himself, at what was truly a unique time in animation history. Neither Miyazaki nor Takahata were involved in the Kondo pilot. They did come to America to work on Nemo, but left early, though not before Miyazaki had met an imaginative young Disney animator, John Lasseter. Apart from the Kondo and Dezaki pilots (the latter shown left), a third Nemo pilot film was also made, this one by Sadao Tsukioka. It doesn’t seem to have been released publicly, so we can’t say how it compares to the other two. Little Nemo’s original creator, Winsor McCay, was a pioneer in animation as well as comics. His best-known cartoon is Gertie the Dinosaur, about a cute brontosaurus, but he also single-handedly made a Little Nemo animation in 1911.